PAP.POO it's a packaging system for dry dog food, designed to use in the outdoors. It has two functions, first as a bowl, and when the food will end, like a scoop for the poo of your dog. The system has three different dimensions, proportionate to the amount of food contained and three colors: pink, green and yellow, one for every taste. 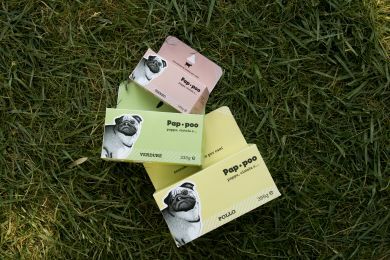 PAP.POO can be used like a bowl for your dog. Thanks to a folding paper solution, you can open it between an easy-open system on the topside of the packaging. When the package is empty, you can use it to take the poo of your dog with a simple movement and throw it away it in the garbage. The packaging is produced in Mater Bi, so it is 100% biodegradable.